Some of the most beautiful gold coins ever minted are the Miss Liberty and double eagle gold coins or the St. Gaudens gold coins. 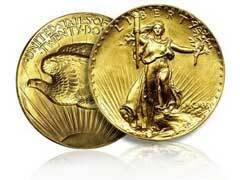 These coins weight 1 troy ounce with .90 troy ounces of fine gold. These American eagle gold coins were minted between 1907 and 1933 and are rare, highly sought after and are expected to actually appreciate in value over time.